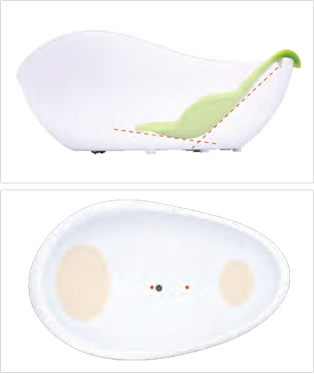 Silicone drain plug that is excellent in sealing was made so that babies cannot touch the plug while taking bath. It has a high durability by using strong steel wheel frames and polyurethane material, not plastic. Adopted silicone rubber packing so as not to move even on a slippery bathtub. Adopted expansion-prevention design at the end of drain to enable draining to the one direction as much as possible. It can be hung on a bathroom wall while not in use.